Posted in: General Information. Tagged: Royal Arch. Pictured from Left to Right: (First Row) Pro. John Morris, Pro. Shaun Sponagle, Pro. Mike Riggi (Second Row) Pro. Ed Stumm, Pro. Tom Dice, Pro. Jack Harley (Top Row) Pro. Chris Gibson, High Priest of Chapter No. 43, Royal Arch Masons; and Pro. Seth Anthony, Past High Priest of Corinthian Chapter No. 224 and Past Monarch of Ubar Grotto. On Thursday, September 18, 2014, Royal Arch Chapter No. 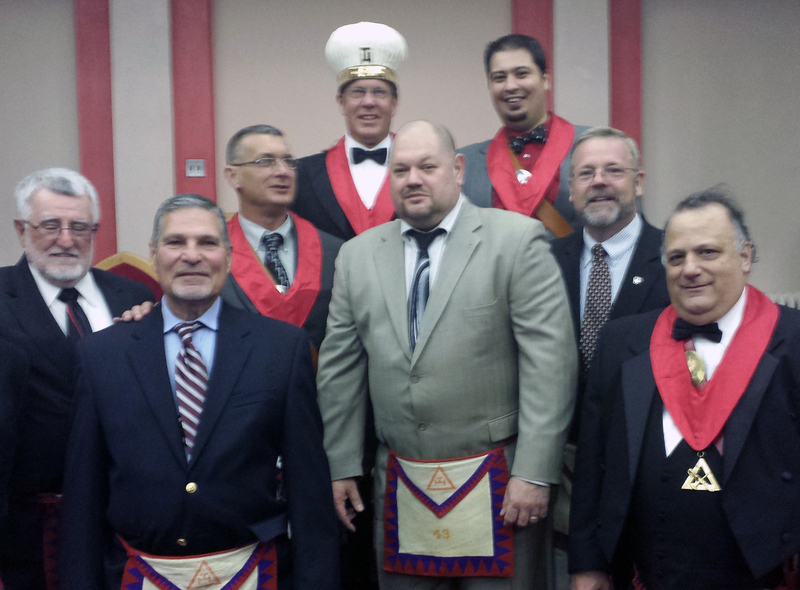 43, located in Lancaster, PA, conferred the Royal Arch Degree on five candidates. Three of those five candidates are members of Ubar Grotto – Prophets “John” Jack Harley, Shaun “Spologle” Sponagle, and John Morris. In a show of support for these men, five additional Prophets attended the event and assisted in the conferral by filling in chairs and doing parts. Many of the Royal Arch Masons present asked why the turn out was so much higher than usual. The Most Excellent High Priest, Pro. Chris Gibson, was proud to tell them it was because Ubar Grotto wanted to be at there to support their soon to be Companion Prophets. It was an excellent conferral that truly showed Sympathy and Good Fellowship! ← That’s the sound of the Prophets working on the chain.